Failure to eat, or a reduction in eating habits in a gecko is not really a problem in and of itself, but a symptom of either an illness or a natural situation. Since most keepers consider regular feeding to be a sign of good health, it is disconcerting when a gecko doesn’t eat. Most of the time, a gecko does not eat well due to illness, stress or life cycle events. A gecko which is impacted, has an infection, a high parasite load, or who has MBD (Metabolic Bone Disease) is likely to stop eating. Some of these illnesses can be observed by the keeper: an infection may show up as a puss-filled lesion, a reddened or swollen area, or filmy eyes. A gecko with a respiratory infection may have plugged nostrils, be laboring to breathe or may make unnatural “croaking” sounds. Signs of MBD include rubbery legs and jaw and inability to bear weight. Geckos who are impacted often have a swollen belly and may not move their bowels for a long time. Although MBD and impaction may be “cured” by increasing calcium and vitamin D3 intake, and a warm soak respectively, geckos who are ill need to be seen by a vet who may prescribe antibiotics or some other treatment. Some illnesses are unavoidable even by the most experienced keeper. However, good husbandry practices will minimize the chances of illness in all gecko species. Geckos often react to stress by decreasing their food intake. You could say that all situations covered in this article ultimately lead to stress and result in decreased eating; this section will cover the stressful conditions not due to health or life cycle issues. Geckos become stressed by a variety of factors including being shipped, other transfers to a new environment, and bullying by other geckos. Improper temperatures, especially temperatures which are too low, also stress a gecko and make it difficult to digest food. In the case of a transfer to a new environment, usually when a gecko has a new owner, the gecko will resume eating once it becomes comfortable in its space. Some geckos have been known to hold out for weeks until they become comfortable in their new homes. In these cases, there is nothing to do but to continue to offer food regularly and to wait until the gecko is ready to eat. It also makes sense to consider the possibility that there is another cause as well, such as life cycle or illness that is occurring at the same time and to treat accordingly. Bullying among geckos may be overt or covert. In some cases, the dominant gecko in a group can be observed attacking another gecko at random, or whenever the other gecko attempts to eat. Bullied geckos may have bite or scratch marks. A more subtle type of bullying occurs when the dominant gecko continually crowds the submissive one out of the spaces it chooses. In leopard geckos, this can be seen when the dominant gecko follows the submissive one from hide to hide and sits on it wherever it goes. A novice keeper may conclude that the geckos are “cuddling” when in reality the opposite is occurring. Geckos who are being bullied must be separated immediately. It may take the bullied gecko more time to to recover from the stress and begin eating, even after it has been separated. Hatchlings do not need to eat during the first 3-7 days of their lives because they are still receiving nourishment from their pre-natal yolk sac. When they do begin to eat, it is not unusual for many hatchlings to start very slowly, only eating 1 or 2 prey items a day. Geckos that feed on fruit nectar diets, such as crested geckos, may not appear to be eating at all, since it’s impossible to tell whether or not they have touched their food. In addition to this normal slow start in feeding, some hatchlings take an even longer time to get the hang of eating and gain weight more slowly than their peers. Some hatchlings have medical conditions, not obvious at hatching, that will ultimately make it impossible for them to grow and thrive. 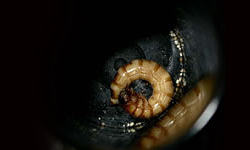 Hatchlings which can be handled can sometimes be encouraged to eat by hand feeding: when prey items are fed, the keeper can hold the hatchling gently in one hand and press the feeder against the gecko’s mouth. Some geckos benefit from the keeper crushing the feeder and rubbing it on the gecko’s lips to encourage a feeding response. Nectar-feeding geckos will sometimes lick the food from a Q-tip. 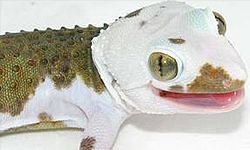 As a last resort, geckos can be fed a pureed “slurry”, developed by Marcia McGuinness of Golden Gate Geckos (http://www.geckoforums.net/showthread.php?t=19356). When young, juveniles often eat a tremendous amount and grow quickly. At a certain point, which likely varies among gecko species, rate of feeding decreases significantly as growth rate slows. This can sometimes occur suddenly and is perceived by the novice keeper as a “problem” due to the change in rate of feeding. As long as the gecko remains healthy and alert, this is probably a normal change. It is also an indication that it is time to change a daily feeding schedule to every other day or every 2 days. Many geckos do not eat the day or days before they shed. (Other geckos have been known to pause in the middle of shedding to “chow down”). Observe the gecko carefully to determine whether it is in the early stages of shedding and wait until a day after it has shed before considering other reasons for decrease in feeding. There are a variety of circumstances related to breeding that cause temporary decrease in feeding. Males often stop eating early in the breeding season as they become fixated on breeding. Females who are ovulating often stop eating. Even if geckos are not in the same enclosure, they may sense the presence of the opposite gender gecko and respond by ceasing to eat. Female geckos who are about to lay eggs often become too uncomfortable to eat in the day before they lay. In addition, female geckos who are relentlessly being pursued by a male may also stop eating, a condition more related to stress, which is addressed above. In most cases, there is nothing the keeper needs to do but wait until the conditions causing the change have ended. Many geckos are sensitive to the change in seasons even though they are maintained in temperature controlled environments. These geckos may demonstrate a significantly decreased appetite in the fall and winter. Some “brumate” during the winter months and may not eat at all, choosing instead to sleep most of the time in a cooler part of their enclosure. For geckos which are brumating or “cooling”, temperatures may be dropped for at least a 6 week period. Food items may be withheld but water should be offered. Keepers should be aware of the possibility that geckos may decrease their appetite and observe them carefully to determine to what extent they will need to be fed during the winter. In conclusion, proper husbandry, attention to possible medical problems and awareness of the natural life cycle of the gecko will most likely result in a thriving gecko and a less concerned keeper. Leopard gecko photo by GoReptile & N. milii photo by PacHerp. I don’t know how to respond to a comment, but I’d just like to thank you for answering my question. Unfortunately, not even and hour after I posted the question, she passed away. Thank you for the help though. I’m assuming she got sick or something went wrong with the pregnancy. Thanks again, Molly. Hello, I recently bought a leopard gecko and he’s pretty young & really skinny so I supply him with enough meal worms, crickets & calcium powder so he can reach a healthy body mass. However he doesn’t seem to have an appetite.. I’ve tried force feeding him but he usually tries to spit it out. I’m really worried because he was skinny when we got him & he gets skinnier by the week. :/ Help please? Yeah, I got him from Petco. I recently went back and told them. They recommended that I force feed him Repta-Boost. So I bought it & im gonna try that for a bit. I hope that works out OK. Remember that not eating is usually a symptom rather than the problem itself, so if it doesn’t work, he will likely need a vet visit to solve what may be the underlying problem, like possible parasites. That’s true. Would you suggest me trying this first & if his condition doesn’t improve then I take him to the vet? The reason why I still haven’t taken him to one is because I work very often I by the time I’m home it’s already really late and the only reptile vet near me is closed. Sure, try it first and if it doesn’t work I’d recommend the vet. If he’ll take the supplement it will mean that he has some food in his system and is more likely to poop which means you can get a sample to the vet to help with diagnose. Hi! I’ve been having some problems with my gecko and I was hoping to find some answers. I’ve been looking everywhere, but no one seems to know what’s quite wrong. My 9 month old gecko, Hercules, hasn’t been eating in almost 2 weeks. He’s shed his skin once since he last ate but refuses to eat now. He ate most of his skin so I figured maybe he just wasn’t hungry after that. He’s been going to the bathroom regularly and drinking water on a daily basis but will not eat his mealworms or any other food I attempt to give him. The last time he pooped it was yellowish mixed in. I use paper towels instead of a sand substrate, his tank is constantly between 80-85 degrees, and he always has water and wet moss in his tank. He usually is up at night and climbing around but recently he’s been sleeping all the time and sometimes doesn’t even open his eyes. Hercules is normally a very energetic gecko but now he’s become very lethargic. I noticed that his tail is shrinking and he’s becoming skinnier. If you have any idea what could possibly be wrong, please let me know! It’s starting to worry me now and I’m not sure what to do! It honestly sounds to me as if he needs a vet visit. The only thing I can see that could use some correction in your setup is the temperature. If it’s 80-85 in the air, that’s too warm (although if the house is that temp due to summer, and it will go down again when it gets cooler, it’s probably OK). If the floor (as measured with a digital thermometer with a probe, not one of those dial ones or the heat strip) is 80-85 it’s probably too cool (should be in the low 90’s). Although geckos do sometimes go off food for, believe it or not, months, if a gecko is lethargic and noticeably losing tail size, it’s time for a vet visit. We have some gecko’s that a person gave us and one is very weak. I suspect it has metabolic bone disease. I can’t get it to eat, because it just flails around at the food and can’t get any in it’s mouth. I’m so distressed watching this creature try to eat. What can I do? Mash up some crickets and/or mealworms and smear the guts (sorry, I know it’s gross) on the gecko’s mouth so it can lick it off. Dip your finger in water, then dip it in calcium powder (with D3) and smear it on the gecko’s mouth as well. Think seriously about a vet visit. Hi Tori, my gecko has the same issues as you described of yours. Just wondering what actions did you take, vet visit or other means, and if Hercules is getting better. Thanks! I just had questions about my gekos. I have two of them both juvenile , one is the all white and it don’t seem like it’s been eatting because every time I video tape them or watch them it always the other one eatting or moving around in the cage which is a poke a dotted geko with different colors . The guy I bought them from said he thinks they both might be females. So I didn’t think about them bullying each other. I only had them since the 10th of October. I been feeding them meal worms. I put 8 in the cage twice or sometimes 3 times aday. I didn’t know if that is too much or not. Is it normal the white one is not eatting? Some geckos take longer than others to feel comfortable and start eating. Some geckos don’t eat much when the weather gets colder. There can be bullying even with two female geckos. You may want to do a trial separation to see if the white one starts eating. As long as she is alert and her tail isn’t getting thinner, it’s probably OK. I recommend you leave a bowl of mealworms in the cage at all times and check it each evening. If the geckos are adult or close to adult size they only need to be fed 3 times a week. Mashed up mealworms is a good idea if he’ll eat it. If there is skin in the gecko’s eye, it needs to be removed. I would imagine that drops would help if there’s an infection, but if the skin is still there it will need to be removed. Hopefully the vet can do this. If the tail is getting skinnier, it would be a good idea to see the vet again. Unless you live in the Southern Hemisphere, this isn’t breeding season for most leopard geckos and you may want to wait until late winter/early spring. hey, so four days ago my geckos tail dropped, I think it was due to infection but I am not entirely sure. Now she wont eat, and I don’t know what to do. I’m thinking about a visit to the vet. I’m just worried about her. She really needs the nutrients from the food to help her tail grow back. I wouldn’t be surprised if the gecko is a bit traumatized and might take a while to eat. It’s more of a concern as to why the tail dropped. If you think she has an infection you should definitely take her to the vet. i just go mine from a women she was selling him for $40 and she only had him for a prop in her room. i was at my dads when i got him and then i went to my moms, And im really scared cause i have cats at my moms but i leave my door shut when i go to school. and i gave him 2 and he did eat them and idk what to do we don’t have enough money to take him to vet even if we can i would be so upset if he sick or something. He did eat what you gave him or he didn’t? It’s not unusual for a gecko in a new place not to eat for awhile. It won’t hurt them. Keep offering food and give your gecko a chance to get used to its new home. They can go for awhile without eating and won’t get sick. Relax, enjoy your gecko, and give it some time to get comfortable. for a cuddle. She just had a shed today and I finally decided to seperate them and have placed her in a ten gallon tank to herself with just a towel substrate, a hide, water and one shallow dish with wax worms and one with mealworms. Not sure if this is normal after laying an egg or how long I should wait before taking her to the vet? She has no lesions or bugs on her and her poop looks normal. I am praying that she just needs a “Rest” and some alone time after laying the false egg? Her tail is so skinny and I can’t comprehend why she won’t eat. I am going to see if being alone in a minimal setting will entice her to eat and gain weight? Her eyes are clear, she is alert and climbs on my shirt when I pick her up. Her breathing is normal, no rasping and sign no nasal exude or mouth rot she just won’t eat! And I am terrified she will starve to death if I can’t get her to resume eating? Please help me? Is there anything else I can be doing? Is this normal after laying an egg? Thank you for your time and advice in advance. Bless you, Lillian. It’s a bit unusual for a gecko to have that much of a change after laying just one egg. I had a gecko this season who lost a lot of weight and had a calcium crash after laying 5-6 clutches. Fortunately, she’s now recovered. I notice you said she only laid 1 egg. Is there any chance there’s a second egg in there and she’s egg bound (you should be able to see the egg as a whitish oval on one side of the belly). I really think she needs a vet visit. Hi… My leopard gecko just won’t eat! I’m starting to get concerned because its tummy is red (not too red though) and whenever I put mealworm dish in front of it, it doesn’t even look at it 🙁 I don’t know what to do. I haven’t tried waxworms or mashed up mealworms and crickets yet. I think I’ll be grossed out. I easily get grossed out… Anyway, should I find a vet? What should I do? Can I get advice? Oh and this is one of my leopard geckos cuz I have two of them. The other one is eating very well! In fact, she looks so healthy… But I don’t know about my other one… His tail was really fat, but since he won’t eat these days, it got a little smaller… Please help! How long have you had it? Was it eating before? Is it in with the other one or by itself? I ask because new geckos sometimes don’t eat and geckos kept together can sometimes result in one not eating due to bullying (even if they’ve seemed to get along in the past). Make sure your floor temps are OK (low 90’s). I do encourage you to try crickets or super worms, because I find that many adult leopard geckos get bored with mealworms. 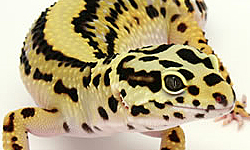 Some leopard geckos eat much less during the winter. I’ve had some that stopped for up to 3 months or more. Read these articles and if you still have questions, come back and ask. 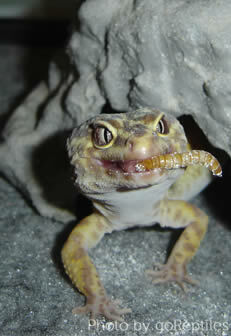 Sometimes young geckos eat a whole lot of mealworms and end up throwing them up. If a gecko throws up once, that’s probably what happened. If they throw up every time they eat, that’s more of a problem. A new gecko is still getting comfortable even after 2 weeks. As long as he’s reasonably active, doesn’t look visibly bloated and the tail isn’t getting visibly thinner, he’s probably OK. Keep offering food and watch for poops. The only real worry about impaction is if he’s on sand. Depending on what the substrate is, he may be pooping in the corners and it’s hard to notice. That happens with some of mine on the ceramic tile substrate since it’s hard to see between the ceramic tile and the back wall of the enclosure. Hopefully the temperatures you refer to are on the floor and not in the air. If they’re in the air, it’s way too hot. I would only recommend the vet if the gecko seems really sick because at this point it could stress it out. He eats every time I offer him food and he can be pretty active, though the last couple days he hasn’t been very active from when I check on him from time to time. He’s on paper towels, so no sand. His tummy looks slightly bloated, but his tail hasn’t shrunk, it’s still as it was when I got him. Do you know what could cause this? I’m wondering if he’s just stressed and I’m just being overly worried. The heat is on the ground, not in the air. I recommend keeping an eye on him and seeing if he’ll get himself back together. hello! I have a 9 inch female gecko named sunny and about 2-3 months ago my brothers friend gave him his gecko because he no longer wanted to take care of him. sunny ate regularly and pooped fine and nothing was wrong with her. a couple weeks ago (maybe three to four) my brother gave her to me because he also got tired of her and she barely finished shedding when I got her. she seemed to love me and she pooped and ate regularly but lately she hasn’t been eating and doesn’t poop as much. I offer her crickets and her water bowl is a little emptier so I’m sure she’s drinking. the air in her tank is about 73 degrees and she has paper towels instead of sand. could she now just be getting stressed because of all of the environmental change? she also isn’t losing any weight and her tail isn’t noticibly skinnier either. please help I need some advice. Am I right that we’re only talking about 1 gecko here? If that’s the case, I wouldn’t be surprised if she’s ovulating. This is about the right time. If you look at her belly, you may see 2 small round spheres. Some geckos don’t eat for quite some time and do just fine. Keep offering and eventually she’ll start eating again. It’s been about a week since my 5yr old Leo ate. He is drinking water regularly. He usually eats every three days this time of year. He eats several gut loaded and dusted crickets, and 1-2 meal worms at a time. He shed his skin, and ate it 8 days ago. This hasn’t kept him from eating in the past. The next day, my kitten broke into his cage, and he dropped his tail. (The kitten problem has since been fixed) His tail is already starting to recover and he’s his normal, happy, social, interactive self. Should I be concerned? If not, when should I become concerned? It sounds as if your gecko had a pretty big trauma and is taking some time to recover. Keep offering food, try not to disturb him too much and I imagine he’ll recover completely and start eating soon. Geckos have been known not to eat for weeks or more without serious effects. If you’re still worried, consider a visit to a reptile vet. Hi guys. I just got 2 juveniles. One is male and the other is female. One is pretty active But the other one just hides. Wats going on? Different geckos have different temperaments. Some get used to a new place quickly and some take awhile. Some will always explore more and some spend most of their time hiding. Give them some more time and see how they adapt. If they are male and female, hopefully you’re not keeping them together because that can result in them mating too early and is not good for them. Hi, I have a three year old leopard gecko named Caspar. About a month ago, he had a lot of trouble shedding (which has never happened before), and I had to soak him and gently remove the skin myself. I have assumed the problem was from the fact our power had gone out for a few hours during his shedding process. However, I am going to include that anyway, just in case. The warm side of his tank is always between 82-92, cold side 75-80. Substrate is reptile carpet. Fed four times a week, with mealworms. Used crickets too a long time ago, but he had trouble digesting them. He’s always been really energetic and loved being held, shed fine, ate fine. Calcium dust is used on his food, though it hasn’t got good reviews, but it was the only kind we had access to for most of Caspar’s life. He’s been getting really skinny- body and tail. I noticed this two weeks ago and started feeding him more often, but it doesn’t do anything. He is lethargic, keeps his eyes closed, drags himself around, and didn’t eat anything last night. There could be an explosion beside him and he wouldn’t move. I don’t believe there are any vets around here that specialize in reptiles (very rural area). I don’t know what to do. It seems he is dying. Caspar’s underbelly has a very dark black/blue area. –does the calcium you’re using have vitamin D3? This is needed to metabolize the calcium and if you’re not using it, the gecko will develop metabolic bone disease (MBD), get floppy limbs and have trouble moving around. –are the temperatures you list on the ground or in the air? There’s not a whole lot of difference between the hot side and the cool side. If they’re air temps, it’s way too hot. Outside of that, it can be hard to know. Sometimes a gecko is in marginal health for years, but it doesn’t show so we don’t know and then after awhile, it gets to the breaking point and the gecko goes downhill. This can be because of non-ideal husbandry or even because there’s something fundamentally wrong with the gecko but it doesn’t show up. It’s not unusual for some geckos to barely eat in the winter. I have one that hardly eats between Jan. and May but he’s 10 years old and recovers well every summer. Even though I’ve been keeping and breeding geckos for about 12 years, I still have some that die mysteriously, sometimes after a number of years. The blue/black spot on his belly may be because he hasn’t eaten in awhile. I’m sorry I can’t be more help. Keep offering food and give it some time to recover. Ok, i bought an adult mack snow leopard gecko(male) and it has been 9 days that he hasn’t eat. He doesn’t even chase the food. I’ve tried to give meal worms and crickets and nothing. i contacted the owner of the web side and he told me that i have to wait a little more. He is too thin to be an adult and i’m afraid that he might died. Purchasing another one is kind of expensive. Any suggestion about what i should do? I am really worried! It’s not unusual for a gecko to sometimes take quite awhile to eat. I got a supersnow once who didn’t eat or poop for 2 weeks. (I’ve now had him for 10 years and he still doesn’t eat most of the winter each year but he’s healthy). Do you know how old he is and how much he weighs? You may have a perfectly healthy young adult who’s not yet comfortable enough to eat. Geckos are very hardy and can go for awhile without eating. I recommend you ask the seller what the gecko is used to eating and then make sure your temperatures are correct (low 90’s on the floor on the hot side). Give it some more time and try some of the suggestions in the article. If the gecko starts to look thinner than it was when you got it, take a picture of it and send it to the seller. I have a two year old leo called Isako and she hasn’t been eating for a couple of days, found an egg a few hours ago but I’ve been worried that she hasn’t had the right calcium levels for a while, I’m even more worried knowing that whatever calcium she has is going into making eggs. I think she may be about to lay another soon but I’m just worried about the toll its taking on her body. I’ve only had her since January and was trying to fatten her up a bit as she was skinny looking but I’m scared she’ll go downhill after this.